I can't believe that it's been nearly two months since my last post. Hopefully a few of you still stop by here from time to time. December and January have been a total blur. Between working 15 hour days, the holidays, and the constant game of catch-up that seems to be my life at the moment I've had limited time and energy to do much of anything. 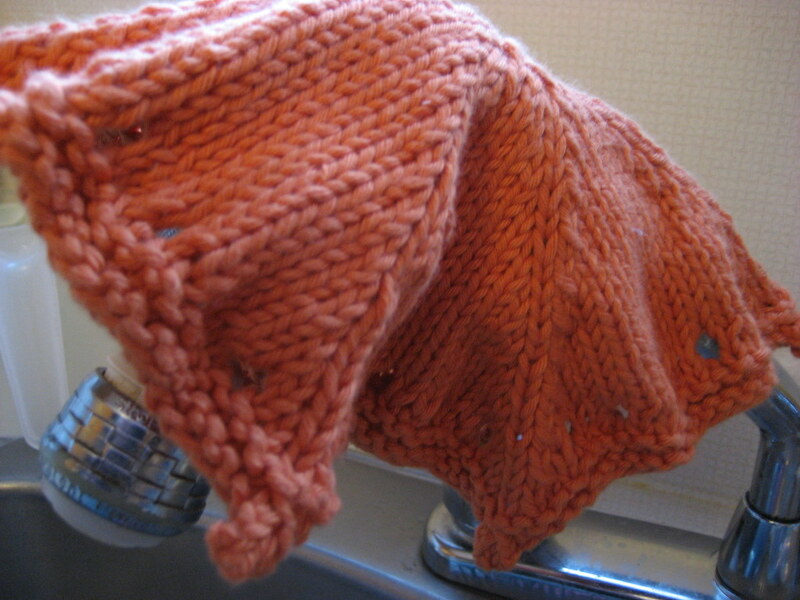 Perhaps the most shocking part of being unreasonably busy is that it has sucked almost every creative thought from my brain, leaving me with absolutely no desire to knit. I have managed to accomplish a few things since the last update. Instead of trying to break everything up into a series of posts I decided it would be easier to just dump everything off the camera into one post so that I can start fresh. November was a month of rampant startitis. There was the Flower Basket Shawl (since frogged with plans to make some sort of lace scarf). 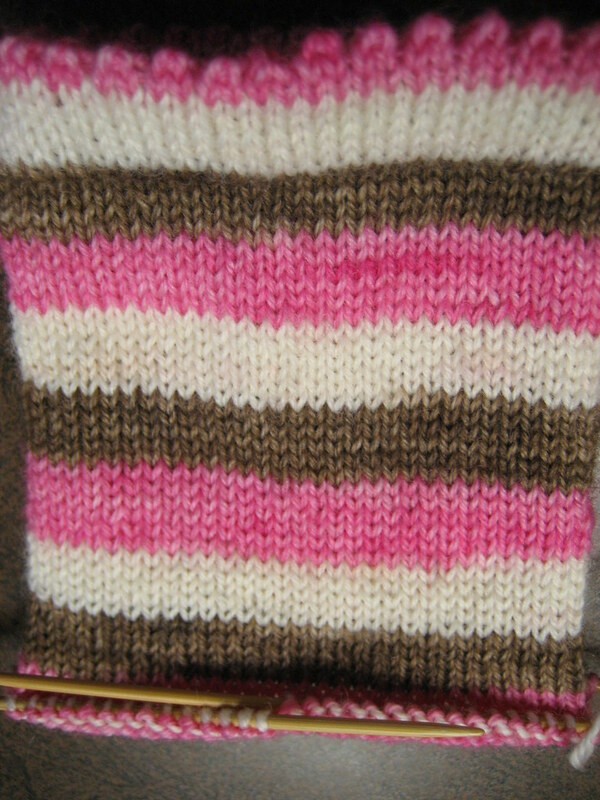 The Ice Cream version of a pair of Cat Bordhi's socks knit in some Vesper sock yarn that's been waiting to be called into action. 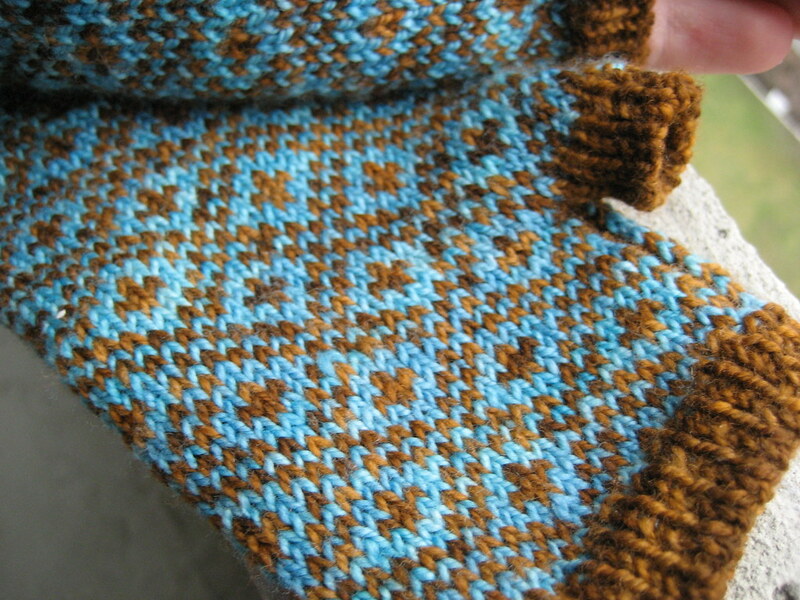 And, the Endpaper Mitts that were finished over the holidays. These were knit using some Sweet Georgia sock yarn I had in the stash. I am still amazed by the fact that these only used about half of a 50g skein in each colour. 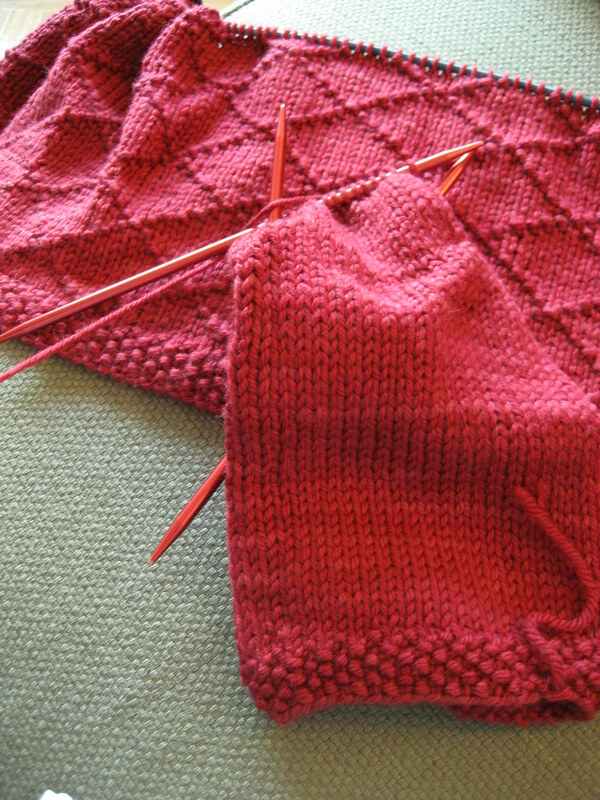 Do you think I could get away with making a pair of Anemoi Mitts with the leftovers? December was all about partially complete emergency gift knitting. 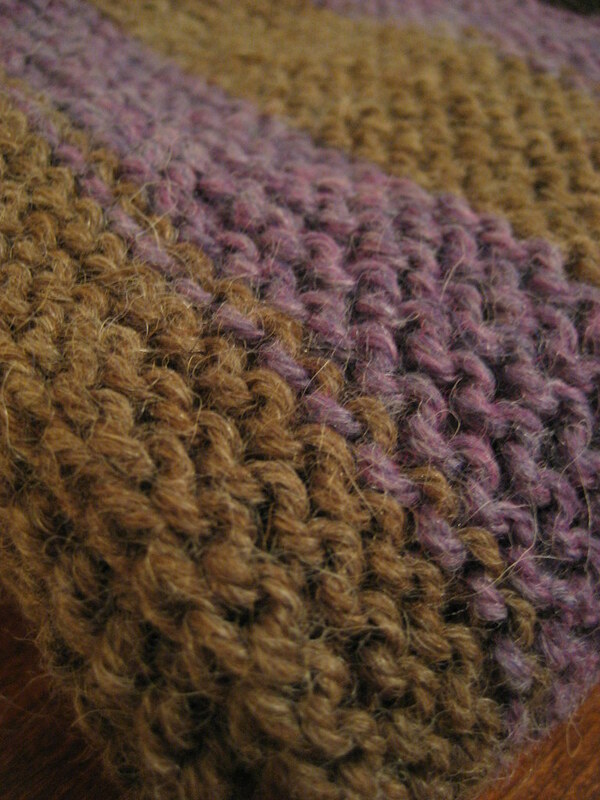 A Garter Stitch Scarf, made with some Berroco Ultra Alpaca for the significant other's sister. The Mason-Dixon Washcloth from some really nice cotton for my mom who is always searching for the softest washcloth known to man. 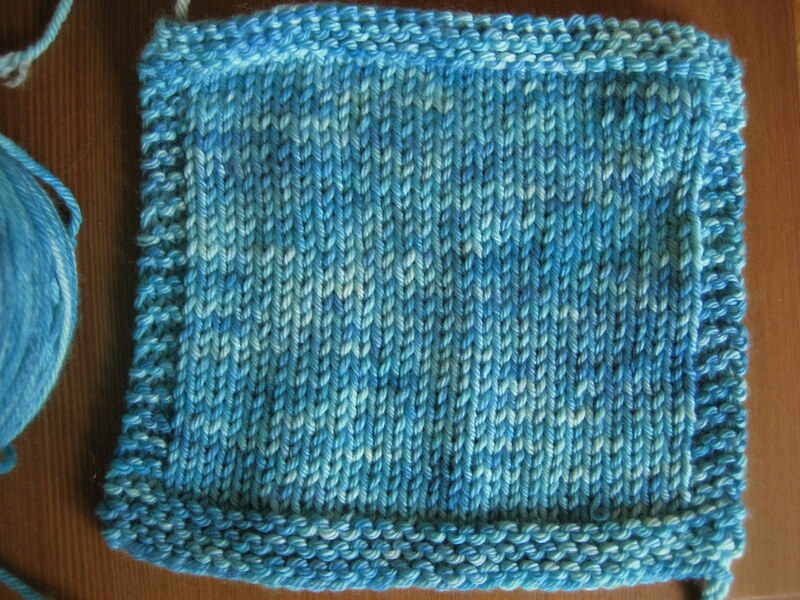 And a pair of Broadripple Socks for my Great Aunt who taught me to knit, still not finished. I'm using some Cascade Fixation that was hand dyed by Laura Chau of Cosmicpluto Knits! 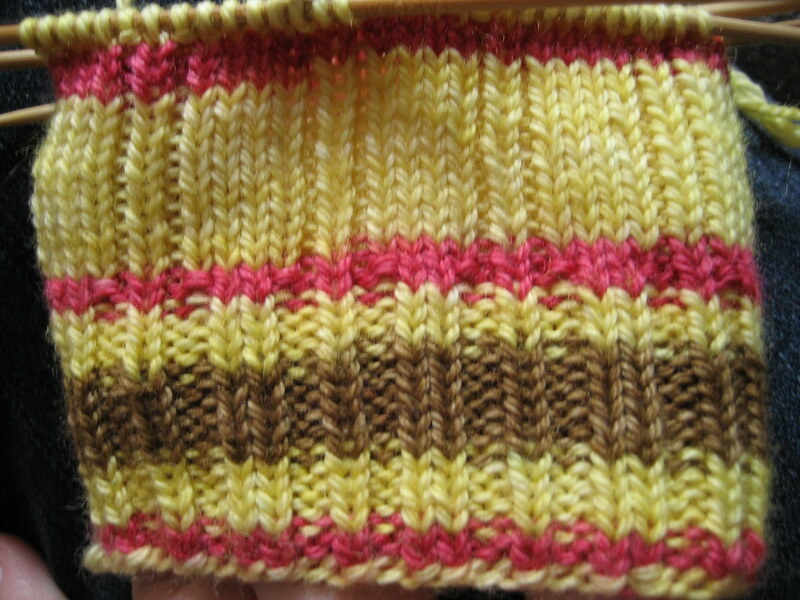 love the colours but I'm still not used to knitting with the Fixation. Luckily the recipient understands the pressures of deadline knitting. January has been a month of resolutions. With just under a sleeve and a yoke to go, I'm nearly finished the Lucy cardigan I started sometime last year (updated pics to come). I like it but I am ready to be finished now that the end is in sight. 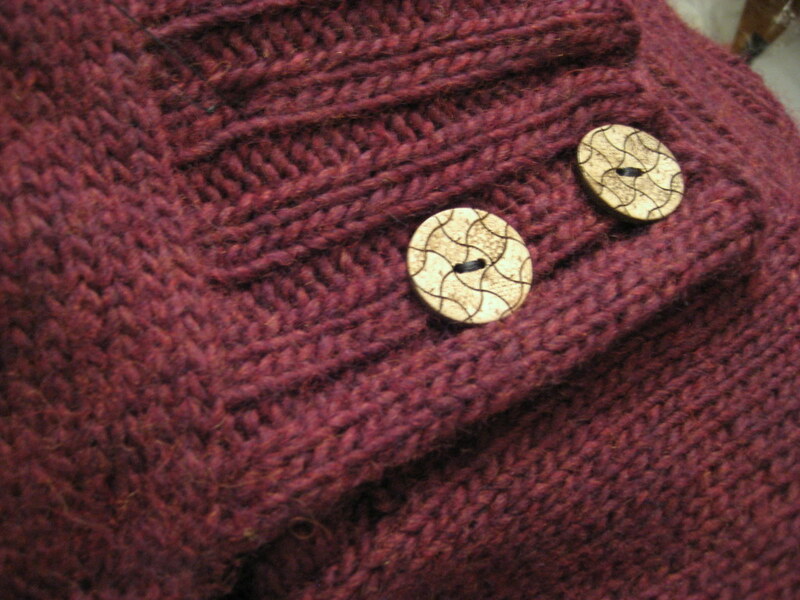 I finally got around to sewing the buttons I bought in October on my Tilted Duster (still no FO photos). 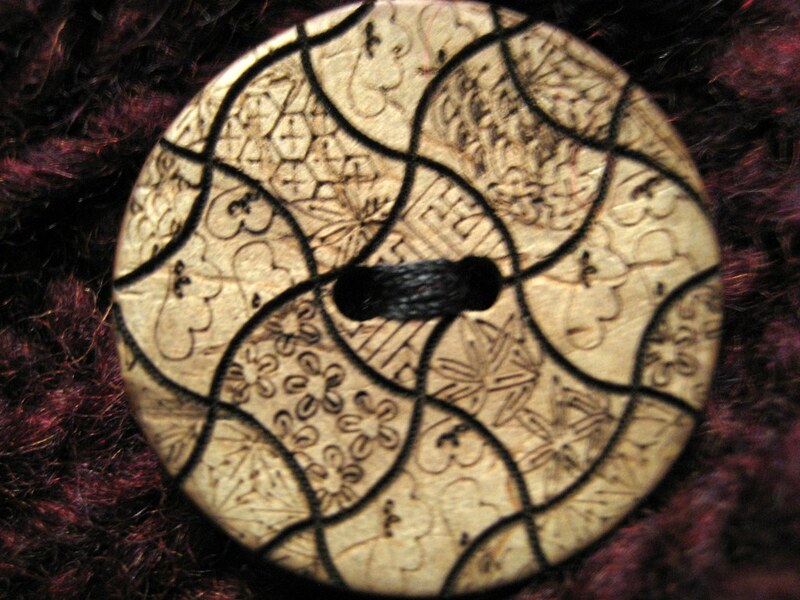 A close-up of the button prettiness. I think it's swell. Happily, I managed to swatch for the Central Park Hoodie I started thinking about a ways back. My very first Nancy Bush socks finally jumped on the needles. I love easy-peasy stripey socks. These are such a great knit that I was halfway through the heel flap of the first sock before I acknowledged that they were never going to fit me. They are headed to the frog pond for a do-over in the not-so-distant future. 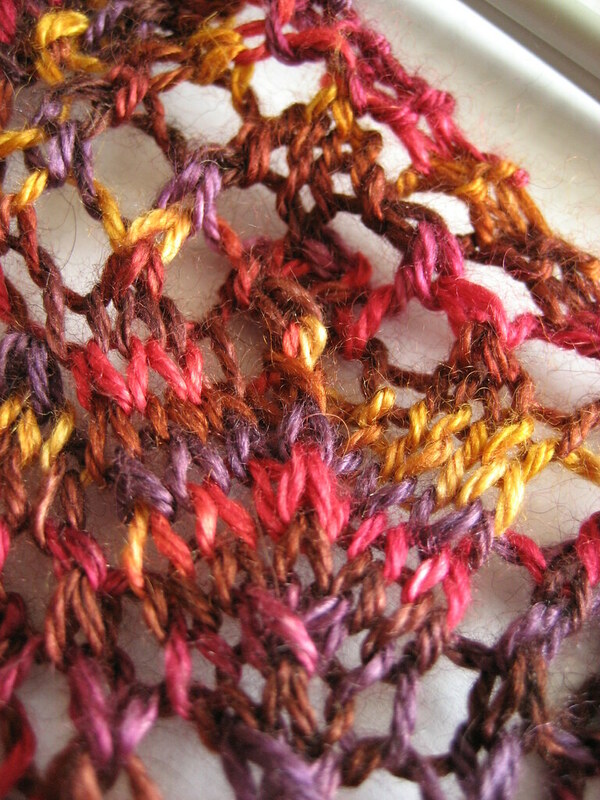 And I decided to frog the Autumn Rose sleeve I plan to reknit it using a different technique to change colours since all the ends that need weaving are already getting me down. Posted by Amanda at 1:14 p.m.
Wow, that's a lot of projects! And yes, we do still keep an eye out over here to see when you'll be back. (You were missed.) I hope the holidays were all good to you! January 25, 2008 at 11:46 a.m.
Oh yeah - and I love the buttons you picked! Wow! You're back. Good. 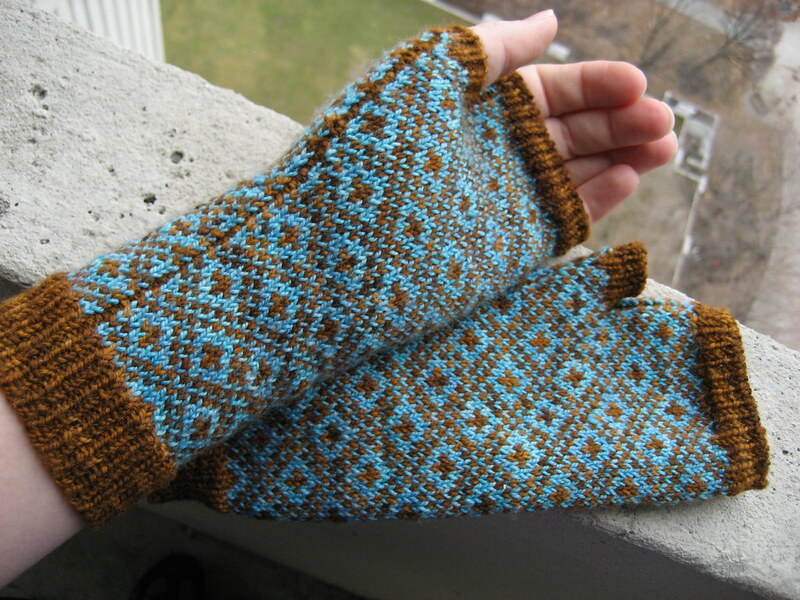 Loe the mitts and the pretty, pretty buttons. January 29, 2008 at 10:20 a.m. I love the Neopolitan socks. They're so fun! 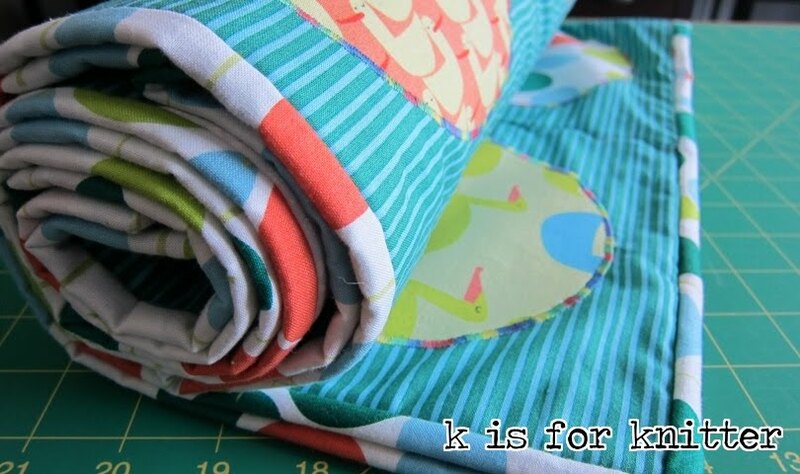 And the colors of the Mitts are my fav. They all look great! February 10, 2008 at 4:55 a.m.
April 8, 2008 at 2:20 p.m.